In this episode, Lynn and Pam are back in the studio to talk about big stitch quilting and quilt samplers of all sorts. This episode is brought to you by The Stitch TV Show shop! Cristy Fincher is a delight! Check out her shop and take a class from her! Our tabletopper will be donated to a good cause when it’s complete. Stay tuned for more details. 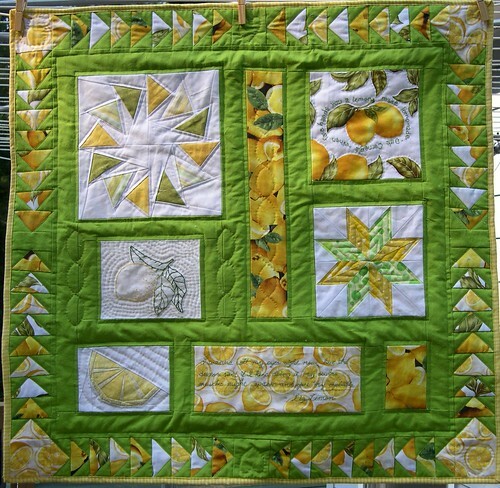 Sarah Fielke is a great instructor of big stitch quilting, and many other techniques. Our next Book Club is Friday Sept 28 at 7pm US Eastern! Liked the discussion on sampler quilts. When y’all discussed setting possibilities, I thought about the Gypsy Wife quilt. Wouldn’t it be considered a sampler quilt? I think so – have you ever subbed in different blocks for the ones she put in the pattern?